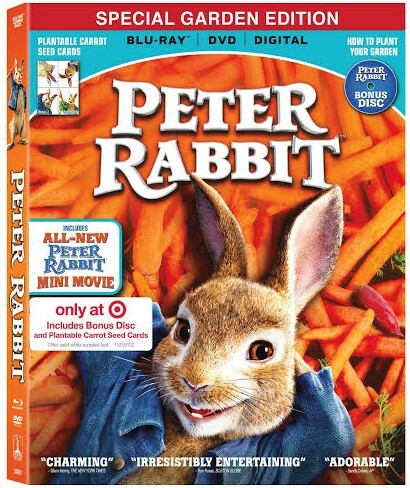 I'm sure many of us remember the tale of Peter Rabbit from our childhood. And honestly that's what made me want to see this movie when I saw the first trailer for it. All those childhood memories from the book brought to the big screen. And after having finally had the time to watch it, I have to say I was not disappointed. I loved every hopping minute! James Corden (Into The Woods, Trolls) stars as the beloved rebellious rabbit in the contemporary feature film adaptation PETER RABBIT™. In addition, the physical skus will also include digital versions of the movie, redeemable via the all-new Movies Anywhere App. Experience all the mischief in McGregor’s garden with Corden voicing Peter Rabbit, Margot Robbie (I, Tonya, Suicide Squad) as Flopsy, Elizabeth Debicki (The Great Gatsby, Guardians of the Galaxy: Vol. 2) as Mopsy, and Daisy Ridley (Star Wars: The Last Jedi) as Cotton-tail. Rose Byrne (Bridesmaids, Spy) and Domhnall Gleeson (Star Wars: The Last Jedi, Ex Machina) also star as Bea and Mr. McGregor.